Napa's BEST Airbnb rentals with coupons, deals, and discounts from Local Wally's Guide to Napa. Cheap places to stay in Napa that aren't rat traps! You need a vacation. You need wine. But one look at the prices of hotels in Napa has you spinning back to reality, wondering if you can afford it. But wait! Airbnb to the rescue! For prices often less than a questionable hotel you can get an entire house, a Napa cottage experience that is better than you imagined. But be careful as not all Airbnb rentals are the same. Just like hotels you need a local to help you find the BEST rentals and that's exactly what you have here - Airbnb and VRBO rentals that pass the Local Wally test for being Napa vacation ready. And even better, every rental here passes my the test for cuteness, quaintness, cleanliness, and instagram ready. In other words, no dumps, no rat trap rentals, just the best Airbnb's available in Napa Valley. Are there Coupons, Deals and Discounts for Napa Airbnb Rentals? I hate always being the one to burst bubbles but most of the "free" deals for Airbnb are bogus, fakes, or minimally hard to use. The only offer that consistently works is the one that Airbnb offers themselves - Invite a friend to use them and they get a whopping $27 off and you get the same when they book. You can also find coupons here but read the comments before you go on a wild goose chase looking for Airbnb discounts. NEW! Stay at Jamie's AirBnB! Everything is fresh and new at Jamie's AirBnB! Located in downtown Napa its location is your perfect jumping off point for a wonderful wine tasting experience. Best yet, Jamie owns the Priority Wine Pass company so she'll help you plan out your day and make sure you get VIP treatment wherever you go. She even drives you to the wineries (additional fee). Great location, great hosts, walk to dinner, and unlike a cramped hotel you get a bedroom, a living room, and a second area for additional guests or just lounging. Coffee, fridge, and a good price makes this a winner for downtown Napa. Don't forget to tell Jamie that Local Wally sent you! Fully renovated 600 square foot cottage located behind the popular Main Street Farmhouse B&B! Two Sealy Posturepedic queen beds and the most comfortable bedding and linens to sleep on after a wonderful day touring Napa Valley. Full bath and a kitchen with refrigerator, microwave, toaster oven and electric griddle. HD TV and Wifi. Plenty of peaceful outdoor seating area to relax in and enjoy on this incredible historic half acre on Main Street! 15 minute walk to downtown Napa and Oxbow Market. Main Street Farmhouse B&B is a licensed Bed and Breakfast and the stated price has the occupancy tax included already for your convenience. There is no deposit required. Continental Breakfast is provided each day or a full hot breakfast is served in the Dining Room in the main house for $13. Beautiful peaceful neighborhood on Main Street, Napa CA. No smoking, no pets, no parties. WALLY SAYS: Great location, a full cottage, simple and farmhouse-y, outside is nothing fancy but inside it's nice and quaint. Charming renovated farmhouse built in 1880 on Main Street! Fifteen minute walk to downtown restaurants and Oxbow market. Comfortable bedroom(s) featuring hotel quality queen beds with ultra comfy bedding. Separate private front entrance to the second floor for BnB guests and we live on the first floor and use the back door so there is plenty of privacy in the home. Private on suite/attached bathroom for this Master bedroom. Room has TV/cable, and all rooms have wifi. Super clean inside and out. 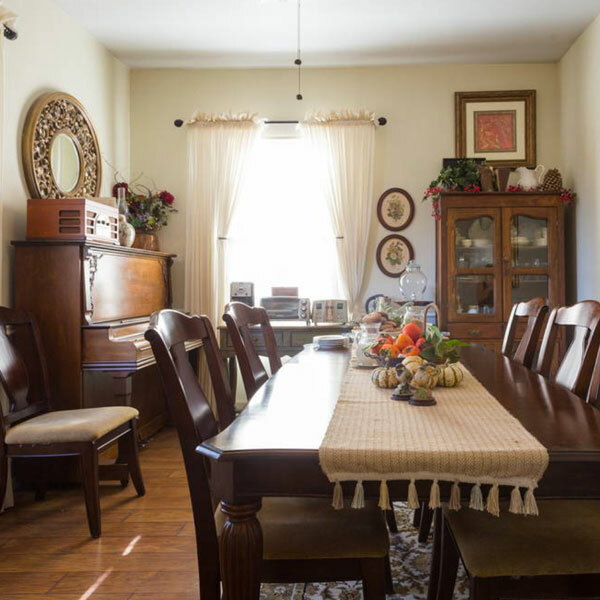 Dining room is a common area with an antique piano. Enjoy a glass of wine on the front porch or back patio with beautiful landscaping on this historic half acre on Main Street! Private driveway parking area. 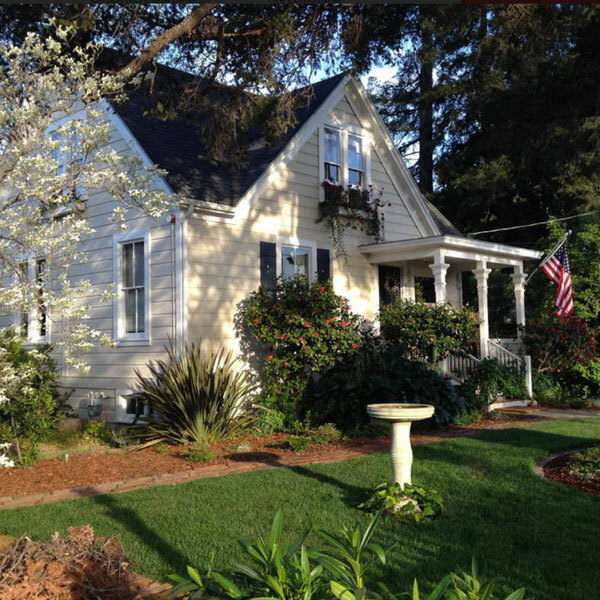 Main Street Farmhouse B&B is a licensed Bed and Breakfast and the price you see stated has the occupancy tax included already for your convenience. No deposit required as we trust our guests will respect the property and rooms. Complimentary Continental Breakfast provided every day in the Dining Room. WALLY SAYS: Don't confuse this with the Main Street Cottage, which is on the same property. This listing is for a large master suite inside the main home. Historic newly-renovated Queen Anne style cottage on large lot. Short walk to Oxbow Public Market & world-class downtown restaurants and nightlife. 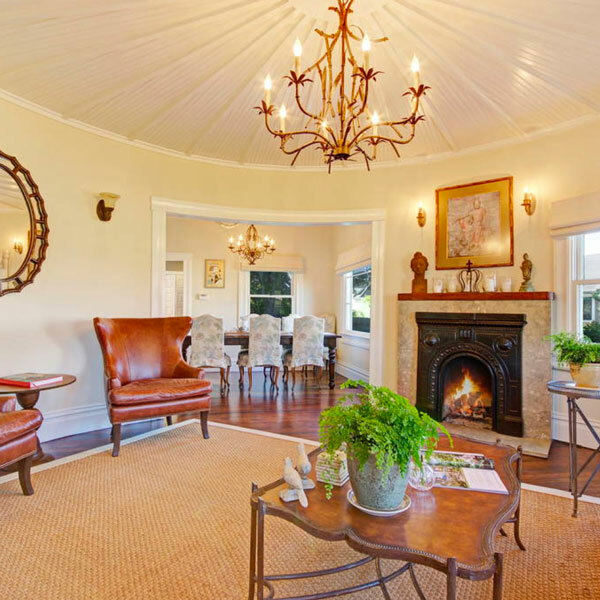 The home's standout feature is the round living room. It is very unique and offers a cozy place to relax after wine tasting excursions or dinner. Enjoy a cup of Nespresso coffee either in the formal dining room, breakfast nook, or on the deck. You will have sole access to the entire upstairs living areas. There are 2 bedrooms and a bathroom. The large bedroom has a sitting area as well as a queen-size bed. The bathroom has a clawfoot tub and telephone style shower faucet for european bathing. If you prefer a standard shower, the downstairs bathroom is available as well. WALLY SAYS: Crazy cool old house, walk to downtown, it's expensive but very nice! Talk about Glamping! 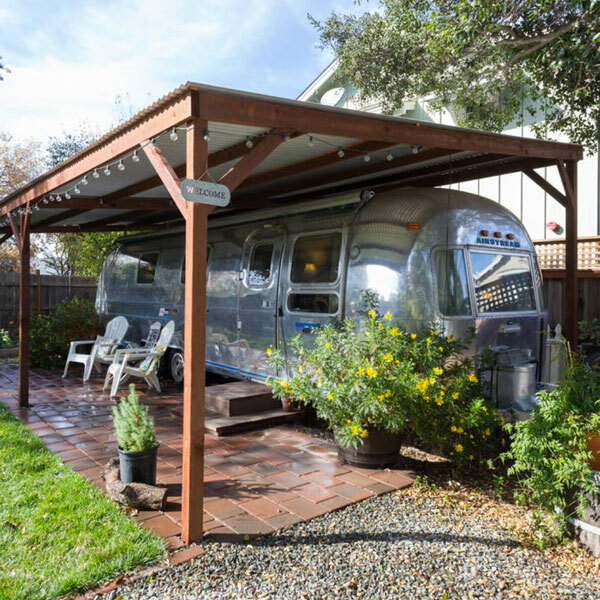 You can go "glamour camping" right on Main Street in Napa California! 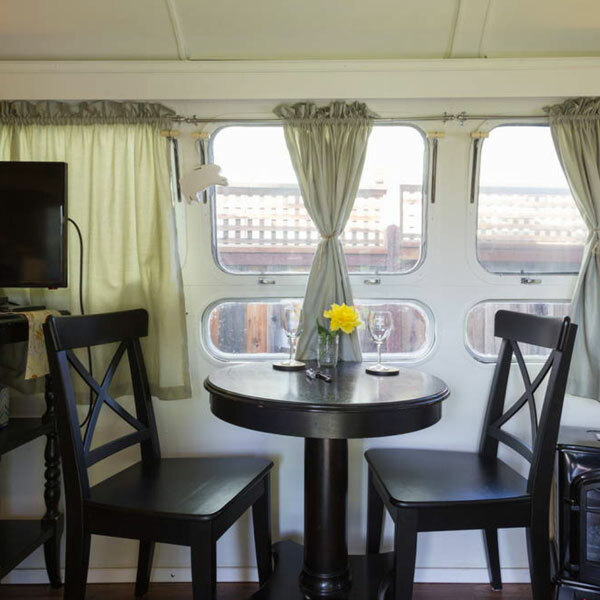 This fully renovated 31-ft Airstream has all the conveniences of home. Fully plumbed with water and drain - plenty of water pressure! Beautiful patio/yard area for you to enjoy too. Main Street Farmhouse B&B is a licensed Bed and Breakfast and the price you see stated has the occupancy tax included already for your convenience. There is no deposit required. Continental Breakfast is provided every morning for guests. Great established neighborhood about 15 minute walk up Main Street to downtown shops and restaurants. The Farmhouse sits on beautiful part of Main Street with great parking. WALLY SAYS: Another part of the Farmhouse and quite unusual, for the adventurous! Save Money on Wine Tasting! Priority Wine Pass | 2 for 1 Tastings | No Phone App Required! Unless you are part of the lucky 1%, a trip to Napa can set you back a lot of dough. Now that you found the Airbnb's to save money on lodging don't blow it all on wine tasting. Instead get the Priority Wine Pass and unlock the doors to over 75 great offers, 2 for 1's, even free wine in Napa and Sonoma. There's no phone app, no tweeting, no phony coupons, just one after another good free wine offer. And if you get the card and email me I'll even help you play out your trip stop by stop based on the wineries I think you will love. So get the card and stop paying full price for wine tasting! Highly recommended. Only $39.88 - Order it Here! Our guest suite is located on 5 acres in the beautiful Coombsville AVA! 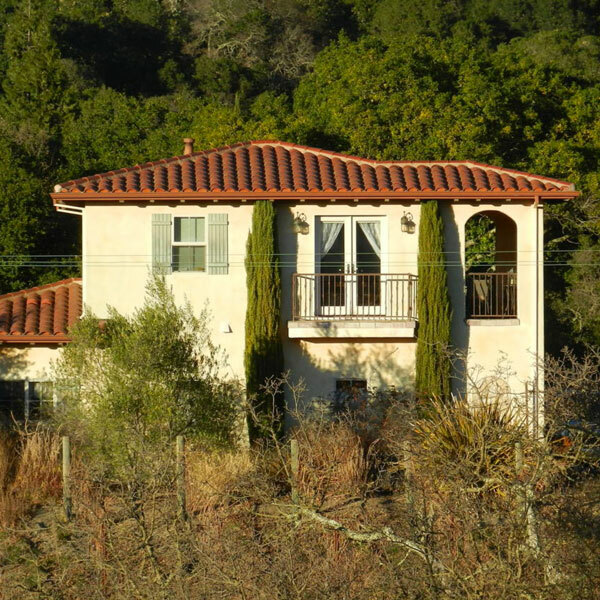 It is on the 2nd floor of a detached garage and is surrounded by vineyards. It is removed from the main house and has a private outdoor sitting area overlooking the vineyards. Located on a country road in a very quiet area in the middle of the beautiful Coombsville AVA. This AVA is home to many family owned and operated boutique wineries, several within walking distance. The property grows and produces a small lot premium Cabernet Sauvignon wine. WALLY SAYS: Three miles outside of Napa but feels like it's far away from the crowds. 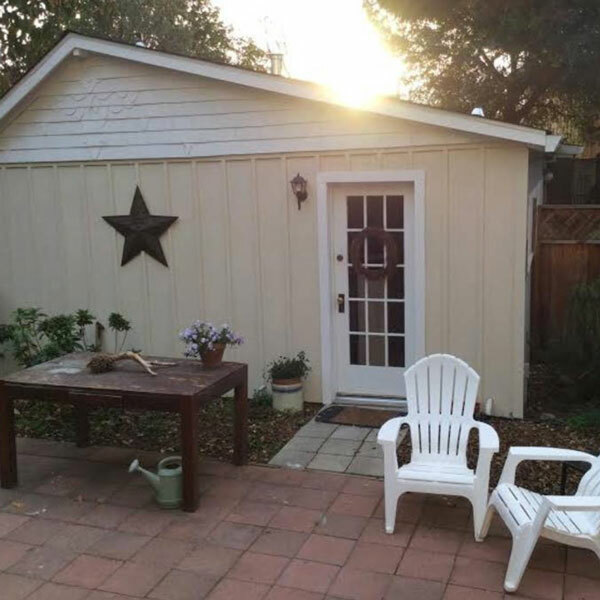 Fully furnished decked cabin on the edge of Napa Creek two miles from the center of town. Eclectic furniture includes a writing desk/breakfast table, a comfortable queen bed, a large flat-screen TV and computer and cell phone access. A mini-kitchen has a microwave oven, a toaster oven, refrigerator, sink and place settings for two guests. The owner's original watercolors decorate the walls. The location is scenic, quiet and private. Deer can be seen at any time of day. There's a path to the creek. Within walking distance is an upscale grocery store, the Carolyn Parr Nature Museum, and a 110 acre city park with hiking trails and a panoramic view of the city. For shoppers, the Napa Factory stores are a little over a mile away. Good restaurants are plentiful within a two to three mile radius. The Writers Retreat is situated in a scenic area that's close to town and only a mile from the freeway. WALLY SAYS: You said you wanted to live in a Tiny House. Try this one on for size! OK, it's funky, it's weird, but sort of cool, too.